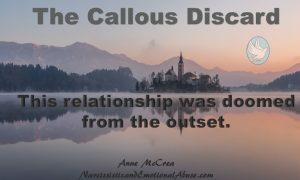 When you first encounter a narcissist, you will likely be sucked into a toxic whirlwind. You will be seduced by their charm and believe that you’ve met your soulmate, someone who possesses the same beliefs, values and standards as you do. They’ve listened very carefully to you when you’ve talked about yourself, your hopes and your dreams and now you’ve found someone who wants exactly what you want in life. That old saying, ‘If it’s too good to be true, it probably isn’t,’ will never be more apt than it is in this scenario. In the beginning the narcissist will have high hopes for their new found love. Maybe this person will be the one who will fulfil their needs, someone who can put right all that is wrong and has gone wrong in their life, someone who will adore them the way that they deserve to be adored and someone who will be different from all their past ‘loves.’ (I use that term lightly.) The narcissist is looking for perfection and soon boredom will set in when they realize that their new darling is not perfect. You are not who you pretended to be at first and you’ve disappointed them. Of course you will be to blame for everything that has gone wrong within this fairy-tale romance. Self-reflection is not a skill that the narcissistic personality has learned or wishes to acquire. In their sick and distorted mind, they will never be at fault. Their frustration at your shortcomings (you’re a normal human being with needs and wants) will be enough for them to think that you deserve to be pulled down a peg or two. How dare you put your needs above theirs! They won’t accept anything less than being your number one priority. Your devaluation will commence. This person who once made you feel special and feel loved more than any other will take every opportunity to demean and belittle you and you will have absolutely no idea what you’ve done to deserve it. You will likely try harder to please and if you manage to succeed this time, they may decide to keep you around for a little longer. In this case, they will return to the person who they once pretended to be. You will likely be so glad to see that everything is rosy again and not question what just happened. This idealization / devaluing phase may continue for quite some time, possibly months or years. With each episode of devaluation, whether it be verbal put downs or passive aggressive behaviour, your feelings of self-worth are liable to take a nose dive. You are never sure how this so easily offended person is going to react so you find yourself walking on eggshells so that you never upset them again. How do you avoid offending someone who appears to be on the lookout for something to be offended by? The short answer is, you can’t. The narcissist will put into practice the devaluation phase. They will likely have done this before in every relationship in their shady past. This process can take many forms such as gaslighting, shaming, belittling, smear campaigns, ghosting, abuse both verbal and physical, to name but a few. If you find yourself in a relationship such as this, do yourself a favour and get away as soon as you possibly can for your own sanity and well-being. The devaluation phase will often be followed by a callous discard with no regard for your feelings. It doesn’t matter whether this relationship has lasted a year or twenty years. They owe you nothing. The narcissist will often abandon you and walk away without warning and without explanation. You’ll be left crushed and traumatised by what’s just happened and you’ve no idea why. This relationship was doomed from the outset. You can never have a normal relationship with a disordered person and believe me when I say that the narcissist is not a normal person by any stretch of the imagination. They are dysfunctional human beings who will live with their dysfunction for a lifetime. The more you read about narcissistic personality disorder, the more you’ll see that you did nothing wrong. Their emotional maturity has never developed in the normal way. They will remain emotionally stunted until their dying day unable to form healthy attachments with anyone who has the misfortune to enter their lives. They are doomed to live their lives surrounded by drama and chaos, their home ground. These delusional individuals will never find happiness and contentment in their lives in the way that you can. These people are eaten up with jealousy and self-hatred. They will never be satisfied with what they have, always wanting more and always reaching for the unreachable. 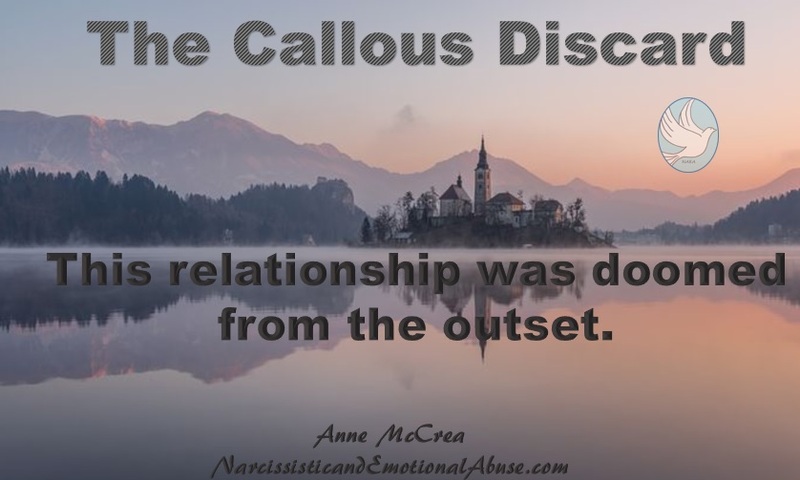 When you come to terms with what has been done to you, which may take some considerable time, you will come to realize that losing the narcissist is not a loss. Far from it, it’s a gain. It’s gaining your freedom and releasing yourself from a toxic fate. You deserve so much more than what this person can ever give you. Close this chapter of your life and start writing the next chapter with people who value you, people who want to see you happy and people who would never obtain any satisfaction from seeing you in pain, knowing they are the cause of your anguish. My discard came from my tennis coach. He does such a thorough job of the coaches discard. To make this brief, he pitted the female tennis players against each other. Not just on court. I saw him say to one woman, I am committed to you then walk over and ask another woman out. He continued asking her out while telling her that he was moving in with the first person he was committed to. The discard came with him screaming at me while l was in the shower after playing 1.5 hours of tennis. He went into the full courts and told the other women I was a prostitute. They had viscous gossip about me for several years. When I was finished showering, he came to the lobby saying, you don’t know what I just did to you. Then he self-reported to the facilities manager. I thought that was enough of a report. I cannot play tennis indoors anymore. He is the head coach, is always there, and can intentionally hurt someone on court with coordinated tennis shots that can sprain an ankle or back, injure the shoulder, and so on. I figured out that where there is energy healing there is also energy harming. I won’t be near such an angry violent man. The worst for me is I used tennis as an emotional support for all that is difficult in my life as well as excellent exercise. He used the gossiping from the other groups to get the promotion then aligned with the gossips and discarded me. Thanking you for your posts, I feel like I have been a victim. Reading this gives me answers to many of my questions in past relationship. It’s a relief to my heart. My was very abusive trowards me and emotional abused and physical abuse he would threaten me infront of our children. He was from a foreigner country He got his residency to green card to citizenship through me. He would put me down infront of the children. He was arrested on mother’s day for domestic violence 2017 i should of press charges against him. I didn’t. He was stocked me through vontage he would get every email who i called he knew i was trying to get into shelters with mt children in return him and his parents from India have forked out the money i have a paper trail and facts to prove but he didn’t he gaslight me and i think he would record me. He accused me of recording him. I should of he plays the victims card he knows i never abused my children and their is times i would be up set because he would set me up. Him and his parents and brother and sister inlaw and his attorney continues to lie about everything and anything and play games and did Domstic violence restraining order against me and took my children away from me. If my children are in danger why in the hell they where in my care all these days and weeks and i was served on September 6th 2017 divorce papers and DV restraining order against me and he took my children away from me my middle daughter was threatened if she stay with me he would have me arrested and he threatened me if i didn’t give him our children pass ports he would have me arrested. He does major parental alienation and abused the system by lies and accusations. No one did portical and contact child welfare to see what he is saying is the truth. Discarded with nothing but his laughter used & abused he gave his glory in seeing that upon me leaving, I had nothing left mentally, emotionally or materially. As he lives like a king & laughs at the poor, me. It is heartwarming as well as helpful to know others have been devastated, like me. I was tricked into believing I was marrying my soulmate—- an honest trustworthy man who was a Christian. He turned to be a con man! The biggest crook and liar I’ve ever met. After 7 years he filed for divorce and left…. but only after embezzling $400,000 from me and leaving me with no money. To add insult to injury, the broken court system where I live caused me to lose $88,000 and five 1/2 years more trying to get some of my money back only to lose that too. I worked for fifty years and the year I was going to retire I found out I had been conned. Talk about depression! No one should be allowed to steal everything from someone just bc they can lie well. After 8 years of a non traditional relationship, we’ve never lived together, I’m realizing she has either NPI or BPD. So it’s been blowing my mind. Trying to wrap my head around how evil these people can be. Remembering everything my mom and family said about her, to be true. Had me believing her over flesh and blood. 2 kids with her so now the real battle begins. Wish me luck.